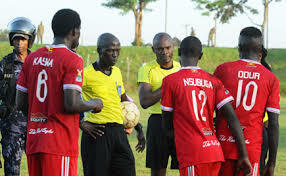 MENGO – After a horror show on Wednesday afternoon, the center referee and his two assistants who took charge of Express’s 1-1 draw with Vipers in the StarTimes Uganda Premier League, have all been banned by FUFA. This was confirmed by the Federation through a press release availed to the media on Thursday evening. “This is to notify all stakeholders that, upon the advice of the Referees Disciplinary Panel and the FUFA Referees Standing Committee, FUFA has banned three officials of match number 54 of the StarThis is to notify all stakeholders that, upon the advice of the Referees Disciplinary Panel and the FUFA Referees Standing Committee, FUFA has banned three officials of match number 54 of the StarTimes Uganda Premier League played on Wednesday 7th November 2018 at Muteesa II Stadium – Wankulukuku for poor officiation, read the statement.. The officials are accused of mis-handling the game in which two penalties were given (one for either side) and also allowed Vipers’ equalizing goal to stand despite the scorer, Tito Okello standing in a clear offside position when the ball was played to him. The goal outraged fans who in turn caused havoc after the final whistle. The assistant referee Samuel Kakembo who signaled for goal after Tito bandled the ball in with nine minutes to play has been banned from performing refereeing services of all FUFA organised and sanctioned Competitions for a period of 5 years. Nantabo Lydia Wanyama who was the 1st assistant in the game has been handed a 60 day ban. The 3 match officials (Centre Referee, 1st Assistant and 2nd Assistant) have been forwarded to FUFA Committee for Match Integrity for further investigation and decision.